This feis is held under the St. Mary’s Cathedal in the “basement” area as we call it. It is not really a basement, more like the ground floor. We have always liked this feis and one of the reasons is because of the venue. Beginners through Prizewinners are located in the very large room in the center of the building while Prelims, Champs and Adult competitions take place in another smaller but still fairly large room across the hall. Check-in, results and the art competition are located in another large room off the hall as well. The wide hallway wraps around the entire large room in the center with beautiful marble floors and although there are no hardshoes allowed, it offers plenty of practice room between dances. The stages are nice and big with marley flooring over plywood. We have never had any problems finding seats as there is always plenty of room. “Camping” is not a big issue at this feis as there are enough chairs for everyone and saving seats doesn’t pose a problem. I have noticed that there is much more “camping” on the floor versus seats in the Championship room due to the smaller size of the room. One thing that has been a bit of an annoyance the last few times has been the hanging of solo dresses for sale on all the doors in and out of the large room in the middle. People will hang the dresses on the top of the door as well as the push bar to open the door. And even though these doors stay open during the feis I have seen people knock the dresses down going in and out and I myself have done this one or twice trying to sidestep a hurried dancer rushing by. I think these dresses would fare much better on a provided dress rack. I know, myself, don’t really relish the idea of knocking down $1200 worth of dress on the floor and wondering how much bling I may have knocked off. As for parking, well, everyone that has ever been to San Francisco knows that parking and that city do not go together. Parking, however, is not usually too much of a problem if you time it right. Parking is free in the cathedral parking lot and if you get there early enough you can find a spot very close. We have also arrived at times where the ages were switching and were able to find a spot no problem. If you are lucky, some parking spots are even covered, which we weren’t quite lucky enough to find this last time when, of course, it was pouring rain. Nothing like walking through the rain in a velvet school dress with tights, full makeup and a wig. As is the usual in our area, we have one judge per stage with three to four stages dancing at once in the Beginner-Prizewinner categories. A few of the judges at this feis, however, seemed to be looking down at their notes more than watching the dancers. A couple of the judges really looked like they weren’t interested in being there and at the end of one age group just seemed like they had given up as they decided to have a conversation with each other instead of watching their dancers. Kind of disappointing since these dancers practice so hard for their few minutes of stage time. Pretty much the same guys at this venue for this feis and the other at this location and we love them. Very consistent, great musicians with a good sense of humor. Very professional. This feis offers one option in food. At the end of the back hallway a table is set up with coffee, water, soda, donuts, bagels, sandwiches and fruit. Beware, prices are high! We usually bring our own food to this one because after you park for free in the parking lot, the last thing you want to do lose your spot to go cavorting around San Francisco looking for food, having to pay for parking, dodging traffic and navigating around in the hour you get for lunch. There is nothing super close by and it’s just not worth it unless you really know the city. 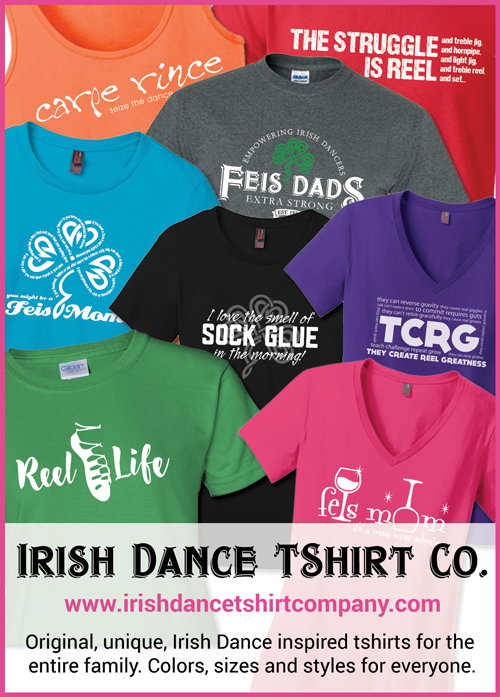 There are usually 5 to 6 vendors at this feis as well as the feis logo clothing booth. It’s been pretty consistent to have the wig booth, and the shoe booth. There is also an Irish jewelry and trinket booth that sells high quality sliver and gold Irish jewelry. One of the popular booths with the kids is the music/knick-knack/Imported candy booth. Plenty of snacks from the U.K. if your willing to pay the price. Also there is usually a vendor that has a little bit of all of the above and a few dresses and dress bags as well. Not a ton of choices, but a nice little smattering for the numbers this feis usually brings. Results are always timely and well displayed at this feis. I love that results pretty much have their own room so no huge crowds to plough through to sneak a look. The people running the results are very nice and helpful too. Lately, adults have been getting their scores for free as an incentive to keep dancing which is awesome so it doesn’t hurt to ask! This feis was very on time and flowed very nicely. The only thing that was mentioned was the changing of the dances from how they were listed on the schedule to being back to back. A few girls missed their dances due to this because they were not used to dances being back to back. Also, it took almost 2 hours for a special to be announced when the dancers in this dance were done dancing for the day and ready to go home. This happened in the middle of the day and I think it was a lack of communication on the part of the people in charge and the announcers.